(anon). A Child's History of Hawaii. Written and Illustrated by Hawaii's Children. Photo available. Honolulu. An Island Heritage Book. 1973. 4to. Hardcover. First edition. Illustrated in black, white and color. Fine copy in near fine (very light shelf wear) dust jacket (in mylar). (anon). A Day in the Country. New York. Marrimack. 1989. Octavo. Soft cover. Facsimile edition. Illustrated in color and black & white. Fine copy. (anon). An Educational Program for Multi-Handicapped Children. Los Angeles. Office of the Los Angeles County Superintendent of Schools. 1972. 229 pps. Octavo. Spiral bound. First edition. Illustrated. Fine copy. (anon). Bedtime Stories for Little Ones. Photo available. Chicago. M.A. Donohue. nd. c. 1930. Octavo. Decorated hard cover. First edition. Illustrated. Near fine copy (very light shelf wear). (anon). Beyond Creating: The Place for Art in America's Schools. Los Angeles. Getty. 1985. 4to. Soft cover. First edition. Illustrated in color and black & white. Fine copy (owner name on end paper). (anon). Cenicienta. Cuento Plegable (pop up). New York. Playmore. 1999. Octavo. Hardcover. First edition. Fine copy. All movables work. (anon). Den Chief's Den Book. New Brunswick. Boy Scouts of America. 1969. Octavo. Soft cover. First edition. Illustrated. Near fine copy. Very light wear. (anon). Dr. Seuss from Then to Now. A Catalogue of the Retrospective Exhibition. Photo available. New York. Random House. 1986. 4to. Hardcover. First edition. Full number line. Illustrated in color and black & white. Important reference work. Fine copy in near fine(light edge wear) dust jacket (in mylar). (anon). 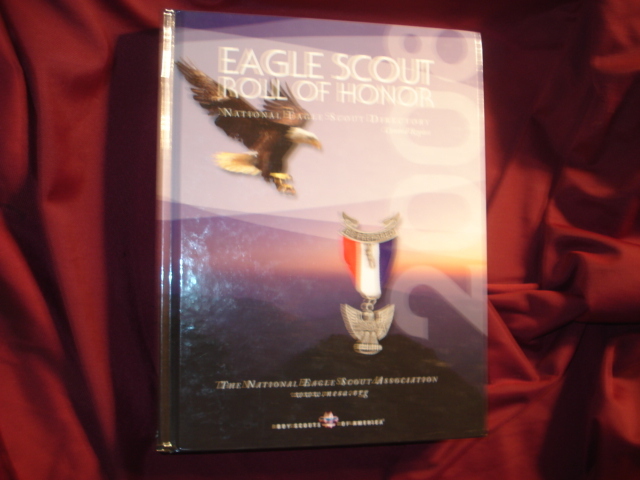 Eagle Scout Roll of Honor. Central Region. With CD. National Eagle Scout Directory. 2008. Photo available. np. Boy Scouts of America. 2008. 4to. Decorated hard cover. First edition. Illustrated in black, white and color. With CD-Rom in rear pocket. Fine copy. (anon). Edgar Rice Burroughs Condensed Bibliography. np. np. Octavo. Hardcover. Helpful list for identifying issue points. Photocopy. (anon). Good Child's Primer. Topsfield. American Archive Pub. 1971. 28 pps. Octavo. Soft cover. Facsimile edition. Fine copy. (anon). Happy Days. London. Pickering & Ingis. 1937. Octavo. Hard cover. First edition. Illustrated. Fine copy (owner inscription). (anon). Junior Girl Scout Handbook. New York. Girl Scouts of the U.S.A. 1994. 208 pps. 4to. Soft cover. First edition, fourth printing. Illustrated in color and black & white. Fine copy. Owner name on front cover. (anon). My Big Book of Favorite Tales. New York. Exeter. 1984. 4to. Decorated hard cover. First edition. Illustrated in color and black & white by Rene Cloke. Fine copy. (anon). My Pop-Up ABC. A Dean's DeLuxe Pop-Up book. London. Deans. 1983. Octavo. Hardcover. Illustrated in color and black & white. Fine copy. (anon). Noah's Ark (linen book). Photo available. Cleveland. Goldsmith. c. 1910. Octavo. Printed linen. First edition. Near fine copy (very light shelf wear). (anon). Rupert. The Express Annual. No. 66. Photo available. Exeter. Pedigree. nd. 4to. Decorated hard cover. First edition thus. Illustrated in black, white and color. Fine copy. (anon). School Friend Annual. 1958. Photo available. London. The Fleetway House. 1958. 160 pps. 4to. Decorated hard cover First edition. Illustrated in black, white and color. Fine copy. (anon). Sleeping Beauty (pop up). New York. HarperCollins. 1995. Octavo. Hardcover. First edition. Fine copy. All movables work. (anon). Small Inventions That Make a Big Difference. Washington. National Geographic. 1984. 104 pps. 4to. Decorated hard cover. First edition. Illustrated in color and black & white. Fine copy. (anon). Stories of Santa. Up on the Housetop Jolly Old St. Nicholas. Kansas City. Hallmark. 2003. Octavo. Hardcover. First edition. Illustrated in color and black & white. Fine copy in fine dust jacket (in mylar). (anon). The Alphabet of Creation. An Ancient Legend from the Zohar. New York. Schocken Books. 1982. Octavo. Decorated hard cover. First edition thus. Illustrated by Ben Shahn. Fine copy (small owner inscription on end paper) in fine glassine dust jacket. (anon). The Dandy. Book 1999. Photo available. London. D.C. Thomson. 1999. 4to. Decorated hard cover. First edition. Illustrated in black, white and color. Fine copy. (anon). The Den Chief's Denbook. New York. Boy Scouts of America. 1948. 178 pps. Octavo. Soft cover. First edition. Illustrated. Fine copy (owner inscription). (anon). The Guide for Junior Girl Scout Leaders. New York. Girl Scouts of the U.S.A. 1994. 272 pps. 4to. Soft cover. First edition, third printing. Illustrated in color and black & white. Fine copy.